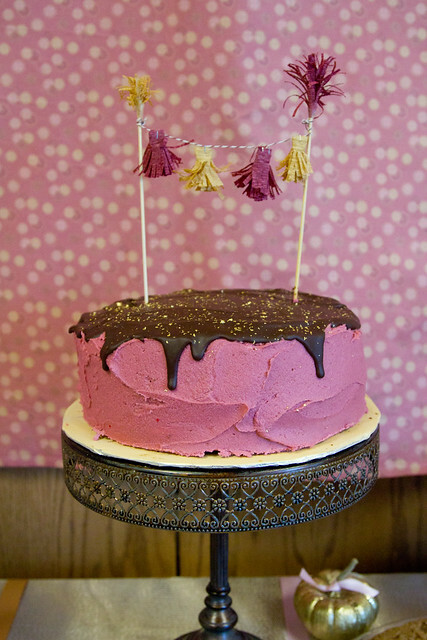 As I was collecting pinterest ideas for this shower, I couldn't get over this cake from Desserts for Breakfast. It was a stunner. I didn't use Stephanie's cake recipe (I used a tried and true recipe from Rose instead) But I did attempt the frosting recipe, substituting strawberry puree for Ollalieberry puree. It almost worked. I didn't use the oreos in the frosting, but used them whole to stabilize the layer of frosting in between the layers of cake instead, which worked awesomely. I also followed her recipe for the ganache, but ended up with a tiny amount, I think I should have maybe doubled it to get her decadent drippyness. And I didn't get the sprinkles on in time to look as fluid as hers either. Things like that happen when you are working in someone else's kitchen and have kids hanging from your body. It was still a pretty awesome cake.